I got four voicemails within five minutes from Rebecca the other day. Each said roughly the same thing: "HELP! EMERGENCY! WHY AREN'T YOU ANSWERING! I'M NOT SAFE!" I had mixed feelings. There was a little "boy who cried wolf" going on because of the time when Rebecca told me she was "getting attacked in the streets." But also, she's living in Paris, and with each voicemail, the entire plot of Taken ran through my mind. So I called her back. Eli: START YELLING OUT EVERYTHING YOU SEE! TATTOOS, SCARS, OR ANY OTHER IDENTIFYING INFORMATION AT ALL! Rebecca: Is this a Taken thing? Because I'm not actually in danger. Rebecca: Oh. I was just walking home from somewhere and wanted someone to talk to. In some ways I want to kill Rebecca. In other ways, she is just me in a woman body. And this confuses me. My apartment is clean. I took this picture to prove it because it may never happen again. A page from my childhood journal. The Mormon Conference Center in Salt Lake City. The usual crowd out at Mormon headquarters near my house passing out pamphlets that explain why all Mormons are going to Hell. 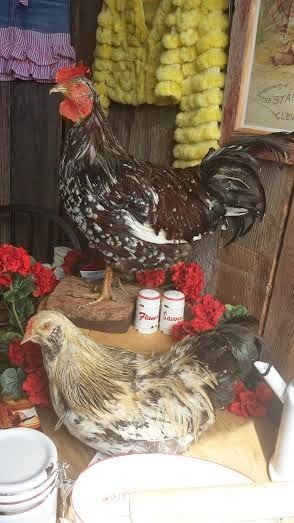 Thanks, Cristyn, who spotted these REAL stuffed roosters at a craft market for ONLY $200. THIS IS NOT A DRILL, PEOPLE! How easy is it to make a hit song? Thanks, Brian. Kids' art turned into freaky toys. Thanks, Benjamin. Flower beards. This world is dying. Thanks, Jessie. Someone get me this book. NOW. Thanks, Janel. 20 European cities to visit. And L'viv made the list! Thanks, Max. Seemingly offensive cards. Thanks, Francie. For those who hate camping. Thanks, Antoinette. Beautiful photos of motherhood from around the world. Thanks, Paul. 30 magical photos of children playing around the world. Thanks, Krishelle. Your apartment is amazing, may I come live with you?? Also, I raise chickens can they come too??? I love it too! It makes me feel whimsical or maybe that I'm in a sort of wormhole to childhood. jgirl, Hannah and I believe that this is as close as you get to heaven in this world. When we're done we just get right back in line. I also sometimes take photos of my house when it is clean. With 4 kids, it's the only way to see it all clean some days. And about the camping: I've always liked camping, but now that we have the said 4 kids, we've gotten a trailer. I MUCH prefer trailer camping. It's like a comprimise of home and camping. I don't do the walk to camp and sleep on the ground thing. That's crazy. I do like to sleep comfortably and get up in the morning, holding hot chocolate, and sitting by the fire in the early morning. I am NOT a morning person, but when camping I am. There is something enjoyable about a quiet early morning by the fire. Oh, I know what Eli's getting for Christmas now! With the group around here, probably more than one. You have such a classy apartment! Love your furnishings. Also, I love Rebecca,... So hilarious. That actually sounds like something I would do.